A middle school boy told me what he liked and didn’t like about his family. Interestingly, he liked the family dinners they used to have. He disliked that they no longer had those family dinners. Even as a middle school boy, he missed family dinners! Family dinners provided him the time he desired to slow down, talk, and connect with his whole family. I have to admit, I was somewhat surprised to hear a middle-school-aged child talking about missing family dinners. Nonetheless, he made an excellent observation. Family dinners provide time to reconnect and bond with our families. They are a time to relax, tell stories, and talk about our daily lives, laugh, and even make future plans. Regular family meals help reduce the rates of substance abuse, teen pregnancy and depression in adolescents. 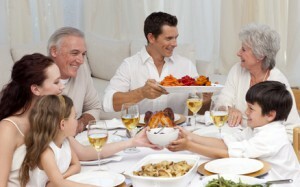 Families that enjoy regular family meals see their children attain higher grade-point averages. “Dinner conversation” boosts vocabulary more than reading does! The stories of personal victories, perseverance, fun moments, and family times help build a child’s resilience and confidence. Include Your Whole Family in the Meal Process. The family meal process includes making the menu, preparing the meal, setting the table, and cleaning up afterwards. Include the whole family in these activities. Make the menu together. One day a week, allow a different family member to pick their favorite food items for a meal. Encourage the whole family to help clear the table, load the dishwasher, wash the dishes…and make it fun with conversation and laughter. Come up with your own creative ways to include the whole family in the family meal process. Plan a Few Dinner Surprises. Your family might enjoy dinner for breakfast or breakfast for dinner. Plan one “ethnic meal night” per week and travel the globe with culinary surprises. Eat your meal backwards, starting with dessert. Plan an “Iron Chef” night and let each family members cook one dish…the family can vote on best taste, presentation, and creativity after the meal. You get the idea. Do something different now and again. Make it a surprise…and have fun. Turn off the Technology. Turn off TV’s, video games, phones, and any other technology that has the potential to interfere with the moment’s face-to-face interaction and family interaction. Learn to enjoy each other in the moment with no interruption. Put it all together and you have a family meal, the special ingredient of healthy families. i agree, eating together is a great time to reconnect. All families should try this.